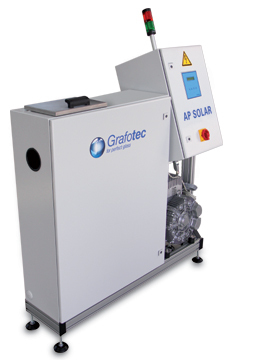 Grafotec AP SOLAR nozzle spray system is developed for the application of powder separator agents in the solar glass industry. The specially developed microprocessor control unit enables a particularly precise dosing of the separator agent and thus provides a uniform, homogeneous application of the separator agent for the special requirements of solar glass production. Most separator agents for solar glass currently on the market.